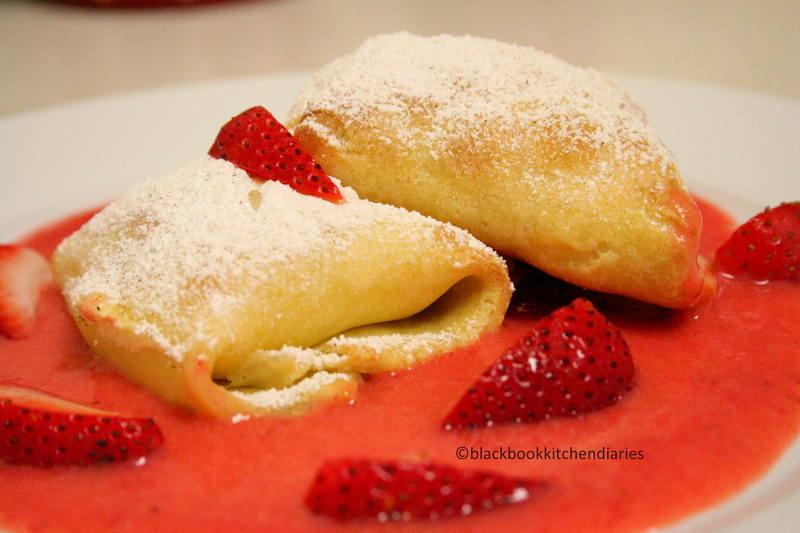 Blintzes always look so irresistible simply because it’s made from a thin like crepe pancake which I like and then stuffed with a cheese filling, which I love. You can fry this babies up or simply brush them with some melted butter and bake till it crisped up and served it with some fresh whipped cream or fresh fruit. Now, you may enjoy this either sweet or savory and most of the time the filling is cheese and sometimes with chocolate. I love making this for breakfast and sometimes I even serve this as a dessert. This kinda reminds me like a delicate version of a burrito only you can’t really fold it up like an eggroll. 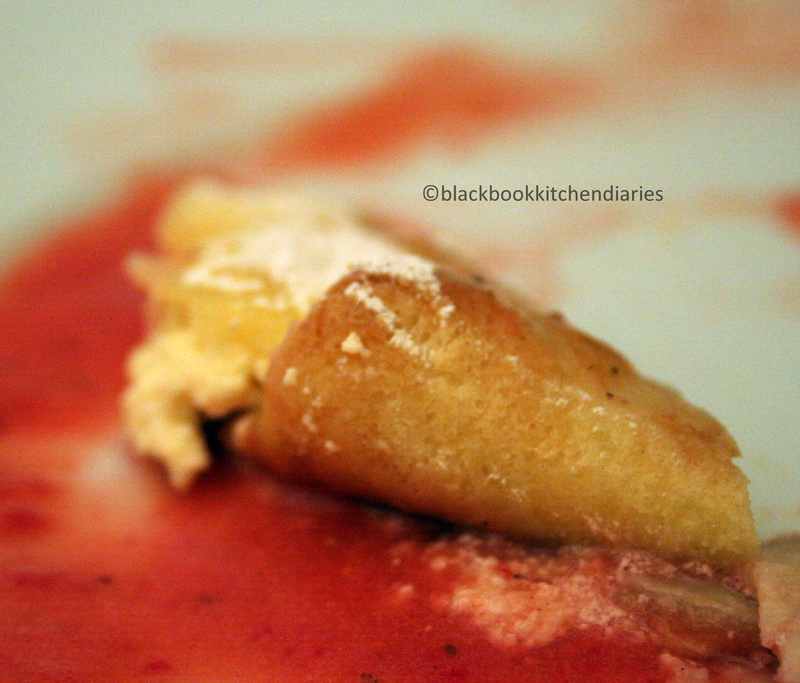 The idea is to tug in the sides so that the creamy cheese filling don’t ooze out while you fry or bake it. I usually place it on a sheet pan line with silpat or a non-stick baking paper then lightly brush it with some melted butter and pop it in a preheated oven on 400 degree F for about 20 minutes or until it is nice and crispy. Making your own crepes can be sometimes be daunting and it can also be a lot of fun. Usually the first crepe is always the one that lets you down (kinda like your first love) and after you get pass that, the rest would be a breeze. I normally make the batter a head of time and let it rest in the fridge for an hour or so; that way the crepes will develop a better texture. You can start making the crepes ahead of time and then stack it on a plate and then you want to cover it with a clean dish towel to prevent it from drying. As for the filling, you can add almost anything you want. My favorite is a mix of ricotta, cream cheese with a couple of egg yolk, vanilla beans and powdered sugar. I have also tried using cottage cheese with a mix of blueberries and sometimes, banana and some chocolate. Yes, it is all pretty darn yummy. yes i am a newbie:) i just checked out your blog! it is so beautiful. Thank you for visiting my blog! You yourself have a great site and the food-photos are top-notch…! Great photos and these look delicious. What a special breakfast these would make. Oh wow! These look amazing! 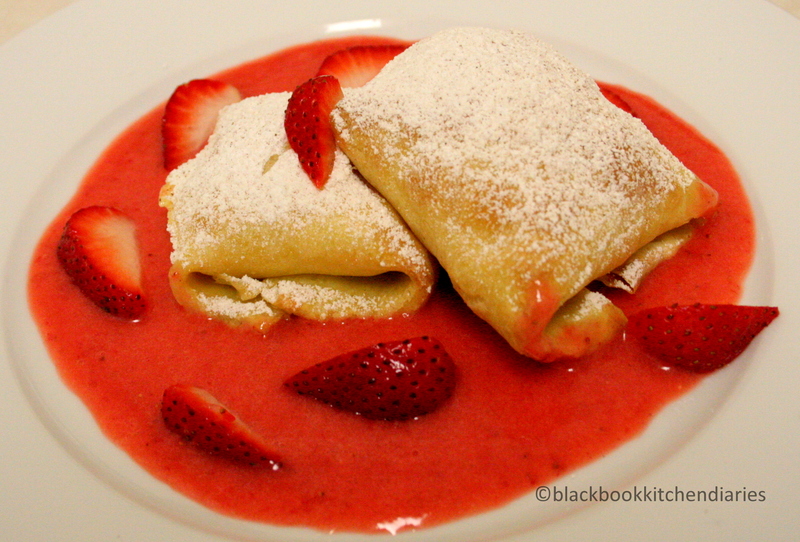 Actually, we used to have blintzes for dinner growing up…it was one of our favorites. My mom always made potato and cheese, and served them with sour cream and applesauce on the side. I never had them with fruit toppings till I was older and eating out at restaurants! thank you so much:) i might just try your mom’s way with potatoe and cheese? sounds awesome! Thank you for your sweet comment on my blog…and I’m so glad it brought me back to this post. Talk about delectable! I love anything that can be described with the words “thin pancake” and “cheese”. I am going to have to try my hand at these for a Saturday morning brunch. thank you and hope you have a nice weekend. So I’m really liking ya…I just subscribed. In your About page, it says you’re 25..me too! So excited to meet another young blogger. We’re still young, right? Right?! Wait, wait, wait…when I clicked to subscribe, it took me to a new page with a bunch of computer code. So I searched for you in Google RSS feeds and all I could find was your Flickr RSS. Is there another way to subscribe to your posts? oh, im sorry that youre having trouble to subscribe, let me look into it and get back to you. Strawberries are my favorite and these look delicious. Wow, those look amazing! And I love cheese and strawberries. But sadly (and amazingly) I’ve never had a blitz. This is all very dangerous..i’m reading your postings before breakfast and now i feel like i must eat everything! Just wonderful..